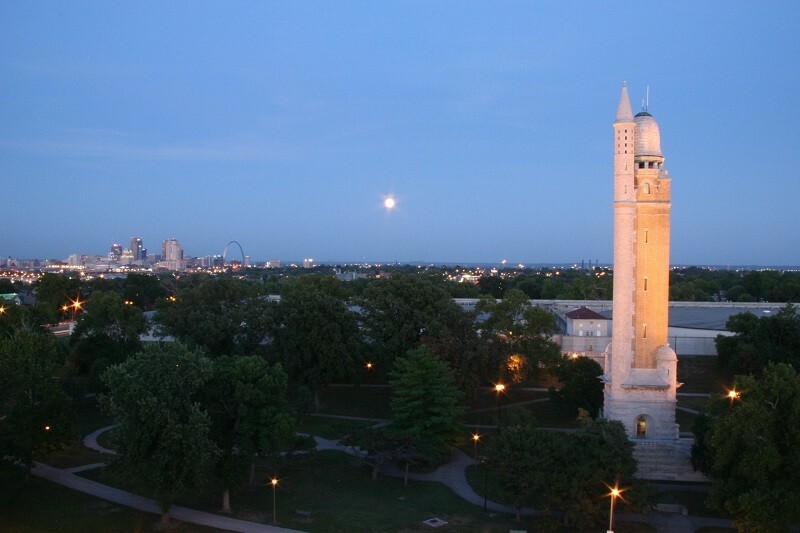 The Compton Hill Water Tower has a pretty great view of the moon and the city, if you can make it to the top. It's that unusual period of the year when baseball and hockey coincide — what strange times we live in. For the non-sports fans this weekend offers a massive BBQ festival, a good-size celebration of St. Louis' love for books and a chance to get a good look at the full moon from a different angle. What would you do if you knew with absolute certainty that you would not live through the night? Would you spend your last hours with loved ones, or maybe try to cram as much living as possible into the time you had left? In the case of Dr. Faustus, he's spending the time offering an apology to a crowd. The good doctor has been a bad man, looking the other way while evil flourished in the world. Evil here is personified by Mephistopheles, a servant of hell who waits until Faustus' time expires and the demon can take his soul. The Mickle Maher one-act play "An Apology for the Course and Outcome of Certain Events Delivered by Doctor John Faustus on This His Final Evening" is performed by Midnight Company at 7 p.m. Thursday and 8 p.m. Friday and Saturday (September 20 to 29) at the Monocle (4150 Manchester Avenue; www.midnightcompany.com) as part of Faustival. 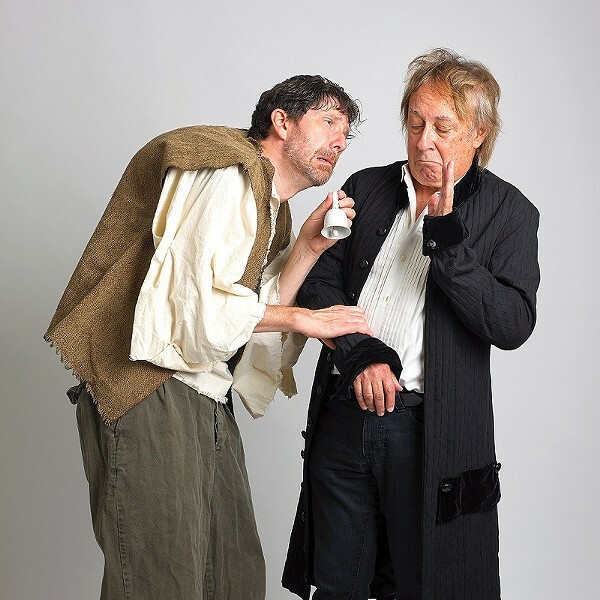 Following "Apology/Faustus" is another Maher one-act, "The Hunchback Variations," which sees Beethoven and the Hunchback of Notre Dame discuss their individual attempts to create "a mysterious sound," efforts hampered by the deafness of both men. Tickets for the double bill are $15. Karlovsky & Company Dance celebrates its fifteenth straight year of bringing free dance to the public with this year's two Dine on Dance shows. 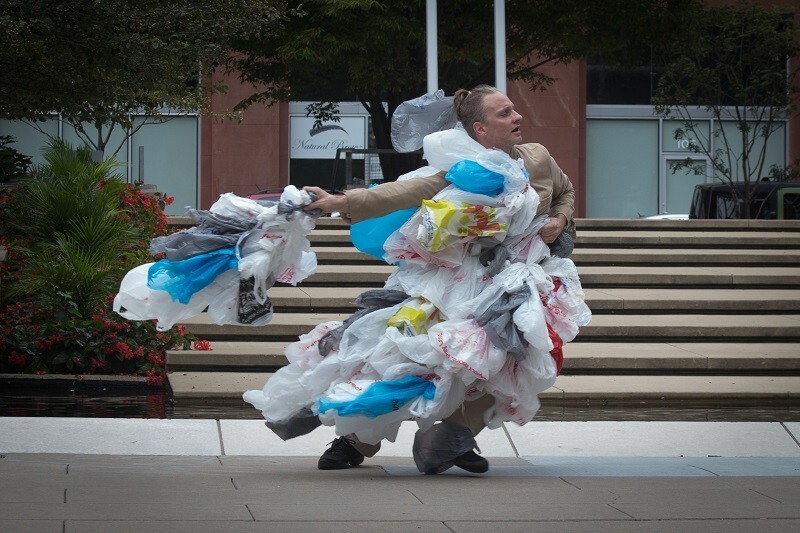 As is tradition, the company will perform a program of newly choreographed, site-specific pieces at Strauss Park (Washington and North Grand boulevards; www.karlovskydance.org) at noon on Friday, September 21. This year's choreographers are Vance Baldwin and Elise Marie Ringenberg, Dawn Karlovsky and dance historian Alice Bloch. Performing traditional folk dances of Colombia, Grupo Atlantico will make a special appearance, while a new piece by Ashley Tate features dance students from the Grand Center Arts Academy. Admission is free, so quit staring at the internet and go outside to get some culture under some sun. A second performance minus the arts-academy students takes place at noon on Friday, September 28, at the Old Post Office Plaza (Ninth and Locust streets). Karlovsky & Company Dance brings site-specific dance to Strauss Park on Friday. There's only one number you need to know to understand what Q in the Lou is all about: 18,000. That's the number of pounds of meat that will be barbecued in Kiener Plaza (500 Chestnut Street; www.qinthelou.com) this weekend. From 4 to 9 p.m. Friday, 11 a.m. to 8 p.m. Saturday and 11 a.m. to 6 p.m. Sunday (September 21 to 23) that meat will be given the smoky respect it deserves from pitmasters Marlando "Big Moe" Cason, Carey Bringle and hometown favorites Mike Johnson, Christina Fitzgerald and Mike Emerson. If that's not enough, you can reserve one of eighteen slots in the Rib Rumble on Saturday and Sunday, which gives you ten minutes to eat as many ribs as you can. You can compete for the sheer joy of it, but prizes go to the biggest and fastest eaters. The Pernikoff Brothers, Hillary Fitz, the Darrells and Nate Lowry play live during the festival, and admission is free. You pay for BBQ and beer as you go, and VIP options are available. If the modern world has you down, you could always escape to the past in Wentzville. The St. Louis Renaissance Festival is back in action from 10 a.m. to 6 p.m. Saturday and Sunday through October 14 at Rotary Park (2577 West Meyer Road, Wentzville; www.stlrenfest.com), celebrating the better qualities of the sixteenth century. There are knightly jousts daily at 11:30 a.m., 2 p.m. and 4 p.m., wandering performers, a royal court with no power to screw up anyone's life, belly dancers, pirates and giant turkey legs to gnaw on. This weekend (September 22 and 23) is Celtic Festival, with kilt contests, beard competitions, a "bonny knees" competition for, yes, the bonniest knees and a William Wallace costume contest. Admission is $10.95 to $19.95. Readers, start your ... glasses, maybe? BookFest St. Louis is back for a second year, with an impressive array of authors from all corners of the Dewey decimal system. Sally Field starts the party at 7 p.m. Friday, September 21, with a discussion about her new memoir, In Pieces, at the Chase Park Plaza (212 North Kingshighway; $37 for one person and one copy of the book). Day two gets underway Saturday, September 22, at 10:30 a.m., with A. LaFaye and Deborah Zemke hosting a children's storytime with costumed characters and photo opportunities at the Schlafly Branch of the St. Louis Public Library (225 North Euclid Avenue). It's off to the races after that, with panels ranging from Deborah Eisenberg, Rebecca Makkai, Anne Valentine and Lucy Jane Bledsoe discussing "Fresh Fierce Fiction" at noon to Michael Isikoff and Sarah Kendzior addressing the worst presidential election ever and authoritarian states in "Russian Roulette: Global Politics in the Age of Trump." If you're into spoken word, Cheeraz Gormon, Paul Tran and Jacqui Germain will be waiting for you at 2 p.m., and at 4 p.m. Wayétu Moore, Bethany Morrow and Marcia Douglas will get into the heady delights of magical realism and speculative fiction at "Alternate Realities: Re-Imagining the Past & The Future." The vast majority of the panels are free to attend, and it all takes place in the Central West End. Visit www.bookfeststl.com for a full schedule. Midnight Company co-founders David Wassilak and Joe Hanrahan reunite for more productions of "Apology/Faustus" and "The Hunchback Variations." The first full moon of autumn rises on Monday, September 24, and if you want to really get a look at the old girl, there's no better view than from the top platform of the Compton Hill Water Tower (1900 South Grand Boulevard; www.watertowerfoundation.org). The full moon tour takes place from 6:30 to 9:30 p.m., and it will take your breath away — it's 198 steps to the top. But what a reward for all that huffin' and puffin'. Admission to the tower is $5 cash, and the platform is limited to 25 people at a time, so there may be a wait. The moon ain't going anywhere, so just be patient. Hockey season ended June 7 when the Washington Capitals victoriously hoisted the Stanley Cup. Barely three months later, the Capitals roll into town for a pre-season game against the St. Louis Blues, ending the interminable period between seasons. Pre-season games don't normally bring much excitement, but hockey is hockey. A couple of young guys trying to win permanent spots on each team's roster may fight and there's a chance for a surprising goal or two, but what you most want to see is complete lack of injuries. Certain Capitals players may not yet have sobered up from the summer-long celebration, so don't expect to see a lot of the big-name players playing regular-season minutes. The game starts at 7 p.m. Tuesday, September 25, at the Enterprise Center (1401 Clark Avenue; www.stlblues.com) and tickets are $8.10 to $144.